Seventy years ago the Oakland Ski Club had no idea they'd grow into such a devoted group, building their own ski club lodge on Mount Donner. Now with over 200 members, if the Oakland Ski Club keeps growing they will need to start building another lodge! The Oakland Ski Club loves their ski lodge, but they also love exploring other mountains. Where do they go? They follow the snow! The Oakland Ski Club makes annual trips to exciting destinations all over the U.S, Canada and Europe. Planning your own Whistler ski vacation should be as stress-free as signing-up for a group trip. Book your Whistler accommodation directly from vacation homeowners instantly on-line for rock-bottom rates. Rest easy knowing you're protected by a safe and secure payment process. Added incentive: Score discount Whistler lift tickets with every reservation. On A Dune, Lake Or Mountain - The Oakland Ski Club Loves to Ski! 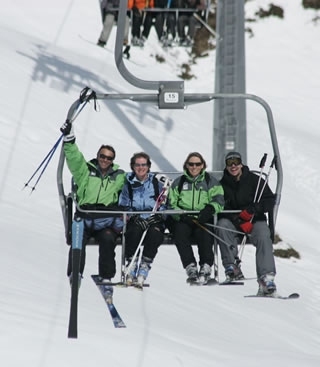 The Oakland Ski Club loves skiing, whether it's on alpine glaciers, sand dunes, local bodies of water, indoors or outdoors. Basically any place you can ski – they do. That’s only their first love though, and when there is no skiing to be found, Oakland Ski Club members dance and ride until they can ski again. The Oakland Ski Club loves to race and competes in races for all age groups. No matter your level of experience or age, the Oakland Ski Club welcomes you to compete. Learn to ski for free with their programs taught by qualified skiing instructors up at Donner Lodge. Jump at the chance to upgrade your skills, or give something new a try - it won't cost you anything! Sick of Your Kids? Glad You Don't Have Any? Enjoy adult only weekends, kids only weekends and weekends with neither (but those are for maintenance, and aren't that much fun). Say goodbye to little Johnnie or little Suzy for the day or even the weekend. They won't mind. Kids love adults-only outings because it means kids-only fun and games for them! Special kids-only bonus: On occasion, the adults stay home while the kids have the Donner Lodge all to themselves (of course supervised by a few adults, but don't tell the kids). While family fun is encouraged and enjoyed, a little separation makes coming back together even more fun! Ready to Make Hundreds of New Friends? The Oakland Ski Club meets the first Wednesday of every month June through April. Membership applications are available at every meeting. Meetings are open to everyone, giving a good idea of what the club is like. The meeting starts at 7:00 pm but come early to socialize and start making friends! Already an Oakland Ski Club Member? Drop us a line if you are an Oakland Ski Club Member. If you have any additional tips or useful Oakland Ski Club information to add to this page, please email us!